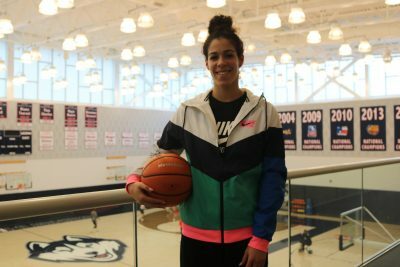 Senior Communication student and UConn Women’s Basketball player Kia Nurse is finishing up her collaboration with East Hartford Middle School for her thesis about young female athletes. Despite her busy practice schedule, Kia has been meeting with a group of students from East Hartford Middle School to work on their communication, leadership and teamwork skills. Kia’s goal for the project was to create a program where young female athletes could understand the benefits of sports other than just winning and losing. “A lot of research shows girls quit sports once they get to high school, they lose confidence in it, it’s not cool anymore, but there’s so many benefits. The team work, the communication, the discipline that you learn through it. That’s why you have to keep playing” stated Kia. She has enjoyed her time working with these students and she plans on continuing to stay a part of their lives in the future. She hopes that her students learn that, “there’s always going to be someone in the world that’s bigger, faster, stronger, more talented than you. But if you can always work hard in everything that life puts in front of you, it’s noticed more”.